Did you know that whilst we provide our customers with industry leading products from internationally renowned manufacturers, we also manufacture our own brand assortments, which includes our advanced security system Dialock? Dialock is our own in-house brand forward thinking identification and locking system. As it is designed and engineered by Häfele you can rest assured that we have rigorously tested the system to ensure that it meets stringent security standards. The system ensures that authorised access to rooms, buildings and furniture is completely within the control of a central user, as such it is ideal for commercial applications such as retail outlets, gyms and hospitals. Dialock is a world-renowned system and can be found in many hotels across the globe such as Ibis Styles Nagold. We are proud to announce our new customer support service Dialock Assist. Dialock Assist is a bespoke, dedicated back up service, available to all of our new and existing Dialock customers. There are three different support packages (Bronze, Silver and Gold) to ensure that our customers are provided with the appropriate level of support for their individual business’s needs. To find out more about the different levels of cover available, please click here. At Häfele, we are continuously thinking ahead to offer our customers products that are built to last and provide our customers with great levels of service; this is core to our business. In January, we launched the Häfele Lifetime Guarantee on six of our own brand product ranges, reflecting our enormous confidence in the product ranges that we manufacture. 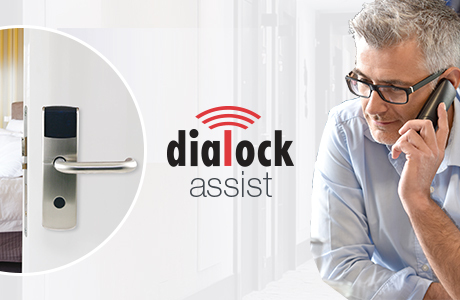 Dialock Assist aftersales support service is the latest example of our product confidence, backed by rigorous testing to relevant industry standards, and commitment to continuously supporting our customers.